Size: 60 to 100 feet tall, 60-100 foot canopy spread, trunk diameter up to 5 or 6 feet. Minimum Ground Space: 15 feet diameter of open ground around a cottonwood tree trunk. Lifespan: Variable, up to 100 years. Female cottonwood trees: Produce the cottony covered seed. Male cottonwood trees: Produce pollen. Wyoming State Tree - Plains Cottonwood, Populus sargentii Dode. Dendrologists do not have a consensus of opinion if the Plains cottonwood is a separate species or a variety of eastern cottonwood - Populus deltoids var. occidentalis. Cottonwood trees are in the Willow family and the Poplar genus. The plains cottonwoods, eastern cottonwoods and other true species of cottonwoods are majestic and magnificent trees, especially when they are allowed to reach their full, unrestricted growth potential. Cottonwoods grow well in Cheyenne and in Wyoming in general. 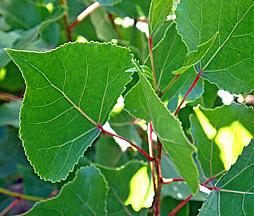 Cottonwoods are typically found growing along streams, irrigation ditches, and around lakes. Although they grow best around a source of water, they can tolerate dry soils, if grown in dry soils from the start. Cottonwood trees grow fast, can grow large heavy limbs, are weak-wooded, are prone to wood decay, and on average have a safe lifespan of 70 years. Additional information on cottonwoods at National Arbor Day Foundation.